We’ve said it once and we’ll say it again: we absolutely love Philips Hue’s smart lighting products, but we absolutely hate how expensive they are. $50 for one A19 LED bulb is crazy, and they’re still quite expensive even when they’re on sale. Thankfully, Philips Hue products have paved the way for plenty of other smart lights, and one of our favorites is on sale today at its lowest price ever. 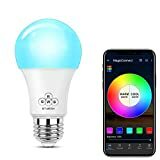 MagicConnect Bluetooth Mesh Multicolor Light Bulbs can be controlled from your iPhone or Android and they don’t require any hub, unlike Philips Hue bulbs. You can add a hub though, and then you’ll be able to control the bulbs with a voice assistant like Alexa or Google Assistant. They typically sell for $18 each, which is definitely a bargain. Today only, however, that price drops to $15.95 and a coupon on Amazon shaves off another 5%. Definitely load up on these awesome bulbs while they’re discounted.